Factory LS engines offer surprisingly good durability. 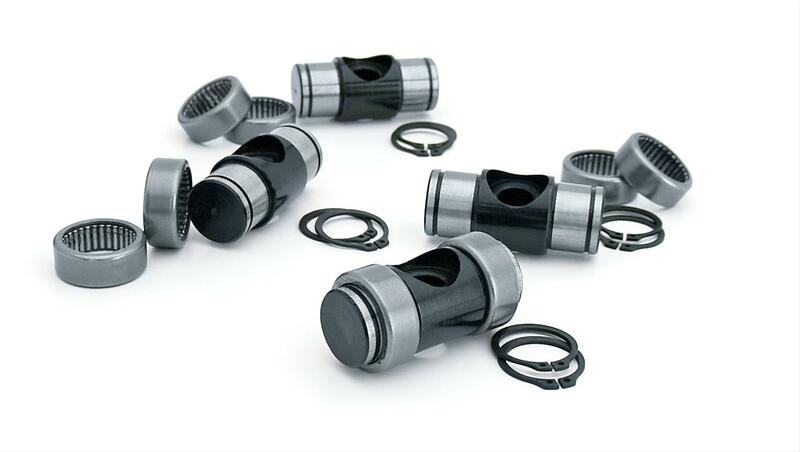 However, in the process of building/modifying any performance LS engine, if you plan to use factory rocker arms (whether re-using originals or using new factory rockers), you should be aware of the critical need to perform an upgrade to these rocker arms. Specifically, the original trunnions and trunnion bearings should be replaced with an aftermarket upgrade kit. In high rpm situations and when used in conjunction with high valve spring pressures, the factory cageless trunnion needle bearings’s outer shell may begin walking out of the rocker arm’s pivot trunnion bore, resulting in individual needle bearings quickly falling out and scattering throughout the engine (the factory needles are captured by two separate housings, and the outer housing tends to walk out, releasing the needles). Obviously, this isn’t good for either the rockers (no bearings) or the rest of the engine. This situation is aggravated by camshaft upgrades that involve increased RPM and valve spring pressures. If, during an oil change, you find small “mystery” needle bearings in the oil or stuck to the magnetic drain plug, this is clear evidence of rocker arm needle bearing failure (the needles have left the rockers and are now lying around on top of the heads and washing down through oil drain back holes on their way to the sump. Knowing that this possibility exists, the best course of action is to address the issue before it becomes a problem, either by changing to high quality Crane Cams performance full-roller rockers which use high quality caged bearings in their rockers, or by upgrading the original rocker arms. Especially for those on a limited budget, upgrading the factory rockers is an excellent option. Crane Cams offers a high quality trunnion bearing upgrade kit, part number 144790-16. This kit, applicable to LS1/LS2/LS3/LS6/LS7 Original equipment rockers, includes new 8620 steel trunnions, new fully caged and pre-lubed bearing assemblies, circlips and rocker arm mounting socket head cap screws (along with two thick installation-assist washers). The new trunnions feature extended width with circlip grooves. Instead of the bearing housings relying on a press fit, the additional circlips serve to prevent possible bearing assembly walk-out. These bearings aren’t going anywhere, so the rocker bearing issue is no longer a concern. This kit is designed to withstand higher RPM and high spring pressures, and deliver vastly-improve durability.